300 Series Stainless Steel (A2) parts are suitable for installation in ductile panels with a maximum recommended hardness of 70 HRB. Self-Clinching Phillips Head Panel Fasteners provide a captivated spring loaded screw for use in thin sheet metal where panel to panel attachment is needed and subsequent access is required. They reduce loose components and so reduce the risk of loose hardware being lost or falling out and damaging internal components. 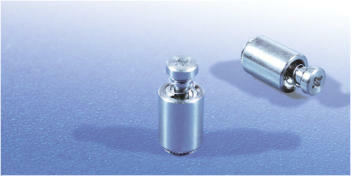 Featuring a fully recessed head, actuation is by tool only. Utilising a special proven clinch feature, this fastener has excellent pull-out and push-out characteristics whilst providing a flush finish on the underside of the panel. Like all self clinching fasteners they are installed using a parallel squeezing action, so require access to both sides of the panel. 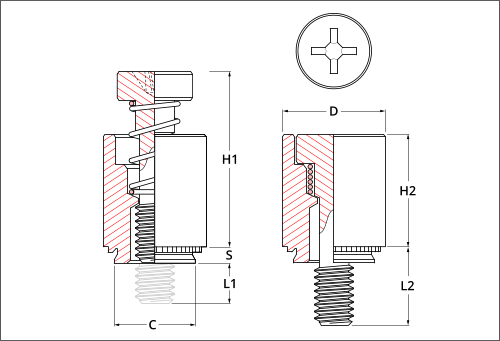 Self-Clinching Phillips Head Panel Fasteners are available in a range of thread sizes and screw lengths, manufactured from 300 series stainless steel, electro nickel plated carbon steel and are suitable for installation in ductile panels with a recommended maximum hardness of 70 HRB for stainless steel parts and 80 HRB for 300 steel parts.